Personalized vodka shot set the Soap Stone Shooters are perfect for parties and home entertaining. Serve your vodka in a way that will send a chill through your guests. These two ounce, hand crafted vodka shooters make a statement- you know good vodka! simply pull the shooters from the freezer, pour the vodka, and enjoy a chilled shot. 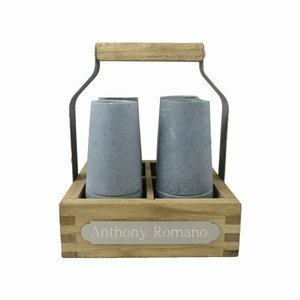 These two ounce shooters come with a rustic wooden serving tray, making it stylish to transport from the kitchen to the table.